The deltoid muscle is a large and powerful muscle in the shoulder joint. During our everyday tasks the deltoid muscle does most of the work for your shoulder movements. Helping us carry heavy loads. Allows us the movement of our arm, simple tasks as swinging our arms while we walk, raise or lower our arm, when we using a keyboard at the computer or driving. Along with the rotator cuff it helps stabilize your shoulder joint from dislocation. Suffering a strain deltoid muscle is a relatively common event and occurs from many situations. We overextended with some movements such as throwing a baseball or lifting too much. Many people working on strength training or bodybuilders focus a whole workout on shoulder alone. These long periods of over-use and abuse to the shoulder muscles can easily produce trigger points pain that can be felt as a deep pain in the shoulder. A fall or sudden injury can dislocated of the shoulder causing damage to the muscle as well. 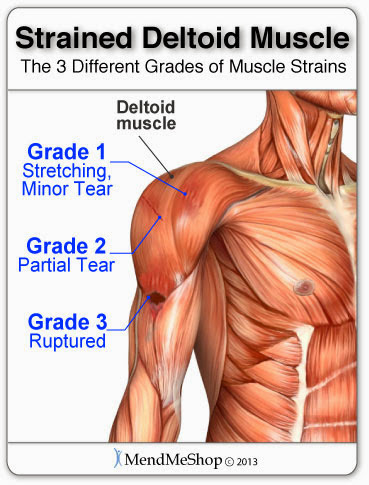 If you do suffer a strain, here is how they are typically graded. Grade 1 - a minor tear of the muscle (10% of the muscle fibers). You may be able to continue your activity because the pain is minor twinge in your shoulder. The shoulder muscle feels achy and tightness for two to five days after the injury, recovery for healing is 7 to 10 days. Grade 3 - complete tearing of over 90% of the deltoid muscle or rupture. This is the most painful of all the grades of shoulder deltoid pain, causing immediate severe pain, considerable bruising and swelling in the shoulder. A slight flex of the muscle might produce a bulge. You may not able to use your arm for daily activities, achy, tightness for about 30 to 35 days, recovery for healing within about three to four months.